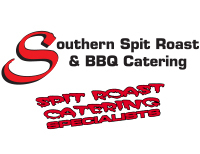 Southern Spit Roast and BBQ Catering offers you a number of catering options, and tailor-made menus to suit all sorts of requirements. You can choose from the traditional spit roast menu, BBQ's, finger food, platters, buffets, affordable menus and delicious desserts. We also provide a delivery service and offer discounted menus for those on a lesser budget such as the express option. Our spit roast meats are prepared in our state of the art roasters that allow for the natural juices to marinate the meat. Our spit roasts meats have the bone in which adds to the beautiful flavour. The high cooking temperatures lock in the meats flavour, ensuring a savory and satisfying, succulent result every time. "Our team are professional spit roast specialists and it is our guarantee that you will be impressed with our very high standard of quality, quantity and service."